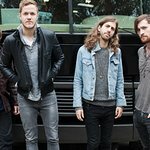 On Friday, Sept. 30, the Grammy Award-winning band, Imagine Dragons will perform at the third annual gala benefiting the Tyler Robinson Foundation (TRF). This extraordinary gala raises funds to support families affected by pediatric cancer. •	Criss Angel: His passion for pediatric cancer research has intensified following the diagnosis of his 2-year-old son with leukemia. •	Dr. Raphael Rousseau: Leader of development or the Pediatric Oncology Drug Development Team at Genentech, Dr. Rousseau has dedicated his career to focusing on hard-to-treat pediatric cancers. •	Gavin, Owen, Quinn and Ethan Morrison: Since learning of TRF in 2014, this family has demonstrated dedication to raising funds and awareness through school and church groups. •	Hyundai Hope on Wheels: This organization funds innovative research and creates awareness, funding more than $115 million in pediatric cancer research in the U.S. Founded in 2013 by Grammy Award-winning band Imagine Dragons and the Robinson family, TRF’s mission is to strengthen families financially and emotionally as they cope with the tragedy of a pediatric cancer diagnosis by providing hope, information, and relief through financial services, caring volunteers, and monetary grants. The TRF is a 501c3 non-profit organization. The Tyler Robinson Foundation honors the life of a remarkable 16-year-old boy who was diagnosed with Rhabdomyosarcoma, a rare form of cancer, in August 2011. As soon as Tyler received the diagnosis, older brother, Jesse, immediately set out to find a way to help Tyler cope with the trials of cancer treatment. As passionate music lovers, Jesse and Tyler found a connection to the Imagine Dragon’s song, “It’s Time”. Lyrics from the song became their anthem and brought them comfort: “…so this is where you fell and I am left to sell. The path to heaven runs through miles of clouded hell.” To understand why this song and in particular these lyrics resonated with these two young men, watch the powerful official TRF video: The Path to Heaven. Imagine Dragons’ front man and lead singer, Dan Reynolds, heard about Tyler’s story and wanted to meet him during a show in Utah. Tyler went on to develop a close friendship with Dan and the other band members, Wayne Sermon, Dan Platzman and Ben McKee. When this inspiring young man unexpectedly passed away on March 4, 2013, Imagine Dragons and the Robinson family created TRF to honor Tyler and every family fighting this battle. The TRF is supported by generous corporate sponsors including SAP, Hard Rock, and NTT Data as together they partner with hospitals across the nation including Primary Children’s Medical Center, Mattel’s Children’s Hospital UCLA, and others to assist these families. Limited tickets still available. Click here to purchase tickets.